Have you every heard of Ron Conway? If your answer is that Conway made whopping returns in his angel investing done in Google and PayPal, you know him well. Have you heard about Theranos? It was a privately held health technology firm started in 2003 that raised more than $700 million from angel and other investors in the next 10 years. Then, Theranos became infamous for its false claims to have devised blood tests that only needed very small amounts of blood. In September 2018, the company finally ceased operations thereby making any equity investments in the company worthless. Angel investors put money as a form of investment in startups. The funds, known as capital, angel investors provide can be in form of one-time investment or a regular dose of money. But angel investing is full of twists and turns. It could either go the Conway route, or the Theranos way. Angel investors have highest tolerance for risk, but not all high risks are adequately rewarded with high returns. This is why angel investors should consider adding P2P lending to their portfolio of investments. Peer to peer lending gives angel investors like you a way to lower risk, but still earn potential 15% annual returns and beat inflation hands-down. Read on to know more. Angel investing requires good due diligence of the company, inidviduals and businesses. This ensures that there are a lot of offline meetings, site visits and more negotiations. Even the fastest due diligences will involve timelines of 30 days or more. The reason for this is obvious: angels only invest into businesses that are run by people they trust. If you as an angel investor cant trust somebody, you cant lend. All the systems and processes that you involve are part of this big mission. This also rakes up your costs since it will involve legal and other officials. In peer to peer lending, the investing experience is entirely online. It is almost like booking move tickets. On a platform like Monexo, you use use the sort & filter functions to check out worthy borrowers. Use online tools to balance the risks and returns. You also build a diversified portfolio by mixing different loan products, loan amounts, tenures and interest rates. Everything is online! 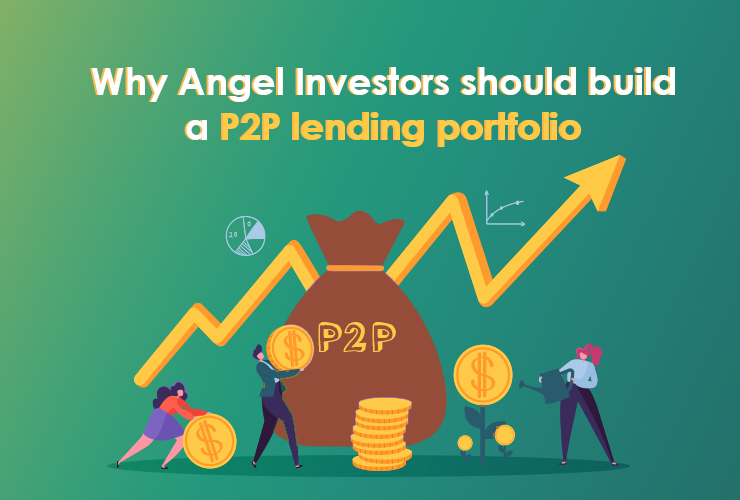 As a result, p2p lending is like plug and play compared to the hassles and challenges of angel investing, where at the last moment a competitor angel can take the cake with a slightly better offer after you put in time and resources. Angel investors get involved with businesses because they expect to see a return on their investment. But, these returns dont happen quickly. Since the businesses that get angel investments are very young, it takes 3-4 years and sometimes even more to be stable. Naturally, the return on investment for angel investors happen after that period. This wait can be agonizing. In comparison, the potential returns in peer to peer lending are much faster. Investors receive monthly repayments of principal and interest. This means you earn money right from the next month. There is much quicker gratification and this allows your invested capital to be used much faster to generate more returns. Though there are no reliable return studies of all angel investments, different studies have tried to give some idea. A study by Robert Wiltbank of Willamette University and Warren Boeker of the University of Washington showed the angel investors achieved an average 27% internal rate of return on their investments. Importantly, the study showed the returns on investments are generated after 3.5 years. Peer to peer lending 15% CAGR. This may look comparatively lower than those in angel investing, but actually they are quite comparable. Returns in P2P lending come from next month. This means you get new capital that can be invested. Angel investing returns happen only after 4-5 years. So, your capital is locked. This cost of opportunity loss is very high in case of angel investing. Additional read: Should Mutual Fund investors change their strategy and add P2P Lending to portfolio after budget 2019? You may be an angel investor to strangers or to your family/friend, but this form of investing suffers from lack of prediction. An angel investor has no hard data to rely on when they invest. Since the business is new and young, often they dont even have audited financials. It is virtually like shooting in the dark. Naturally, angel investing returns have to huge so as to compensate for these factors. Peer to peer lending is based on scientific data. There is a lot of data and compliances that are part of the p2p system. For instance, Monexo has partnered with CRIF Highmark Bureau in India and built a proprietary credit scoring model. This is based on decades of payment behaviour by millions of Indian consumers to financial institutions in the past. This scoring model predicts the probability of repayment by the borrower. Also, ratings are available for p2p loan applications. Every loan application received by Monexo is screened and given a Monexo Rating. The ratings range from M1 to M8, with M1 being the best. Once the loan listing is approved, the Monexo Rating is displayed in the marketplace along with the loan listing details for you to view. So, as an investor, you always have a good idea about what would be the fate of your investments. Anybody who has experience in angel investing will tell you the amount of stress they have to handle. There are many reasons for this stress, but the biggest one is that a large investment has to be justified with a large enough return. The bar is set very high for angel investors. So, angel investors expect the startup or young enterprise to deliver high performance. When this does not happen, there is stress and strain. Often, this leads to complete breakdown of relationship between angel investors and the entrepreneurs because there is pressure on every one to make money. In comparison, p2p lending is like walk in the park. Why do we say this? It is very simple. P2P lenders do not need to sit on the head of the borrowers to get their returns. All investments involve risk, but platforms like Monexo aim to ensure protection and safety. P2P investments are diversified, which means you are always advised not to put too much of money in one investment. By lending to many borrowers, you can lower risk of defaults and also enjoy smoother return experience. For example, on Monexo marketplace you can lend as little as Rs 1,000 per loan and spread an investment of Rs 1 lakh over 100 different borrowers in your portfolio. Instead of funding an entire loan, you can participate by funding parts of loans. Angel investing involves good amount of money. Even a small sized business like a restaurant or salon requires Rs 10-100 lakh as initial investment. Angel investing thus cannot be done with small amounts, even if you know that the chances of returrns are quite good. It is not easy to fork out Rs 10 lakh at one go, especially if your investments are locked for 3-4 years. Peer to peer lending does not have high minimum investment requirements. Platforms like Monexo allow p2p lending with as low as Rs 1 lakh. Such an amount can be easily invested by regular angel investors. With sufficient levels of diversification, this amount can generate healty returns that beat inflation and manage risk. As per current RBI norms, an investor can maximum lend Rs 10 lakh across all P2P lending platforms and can maximum fund Rs 50,000 per loan. Additional read: How can I grow my money with P2P lending? High risk-high return angel investing may be a growing fad for affluent investors, but there are easier alternatives like peer to peer lending available in India. P2P investments cut the paraphernelia out of investing and allow you to focus on the priorities. What's more, everything is online and this mean you do not need to fix appointments and physically visit borrowers before lending and after lending. Platforms like Monexo do the boring work for you in the background so that your investing experience is supremely comfortable and the returns do justice to your expectations.